Crafters Digital Art Center has some fantastic giveaways for its first blog hop. I’ve added the details below, for those who haven’t already started their blog hop journey I am 20th on your list of amazing sites and I hope that you've been enjoying your journey so far. Comment on this post and you could win a $12.00 Gift Voucher to spend in my store. You will have to check on CDAC to see if you won. I started my range of 'Nana Vic's Digitals' 4 months ago come the 6th of October and it's been an amazing adventure for me. With 10 'Nana Vic' designs, 6 Miscellanous and 11 word art sheets now for sale in my store. I hope that you will take a minute to view some of them while your here. My Quick Reference Page is the fastest way to view what I have on offer. My lastest digital is called 'Nana Vic Marbles' and I've just introduced 'Mr Jones' to my range. I'm hoping that he will be recieved with as much love as 'Nana Vic' has, as I've got plenty of antics for him to get up to in the upcoming months. Thank you so much for stopping by and I look forward to reading your comments. Please scroll to the end of this post to visit your next hop site. You will be taking a journey through some of the CDAC Artist blogs. I hope you fine some images you can use for your creative crafting experience. The hop starts and ends right here on CDAC. Each artist will be offering up their own prize from their digital line and as the Grand Prizes, we have three fantastic gifts donated by “The Original Scrapbox” So together we have over $300 worth of prizes! Among the digital images the artist will be offering, we have three GRAND PRIZES…..
2. You must comment on each Artist’s blog hop post. 3. You must enter Mr. Linky below! 4. You must visit “The Original Scrapbox” site, pick out your favorite item and post a comment HERE with which item you like and why. 5. Have fun and enjoy the blog hop! You have some really sweet images! I love you word art, too! Your images and word art are so great. That kitty is so darn cute. Thanks. What great drawings and stamps! Very talented!! I'll be back for sure! Love the kitty in the mailbox. Thanks for sharing your talent. 1. THANKS for the wonderful cat-in-the-postbox freebie. 2. Your images are gorgeous! Being a fellow nana, I will have to look further into these images! They are adorable! Thanks sooo much for the cutie cat freebie here. I would love to find one alike with a dog, as I have a dog, who´s just as spoilt, and would do this too, if he could ha ha ha. Thanks for a great hop here too. Hiya! This is Linda, fellow designer from tortagialla digital stamps also in this hop - but just wanted to say your digis are lovely, they make me think of great storybook illustrations! Your art (images) are beautiful and I love your blog! How nice you could use your talent to support your family. What a blessing! Thank you for sharing! Your images are some of my very favorites! You are very creative and think outside of the box with your images. 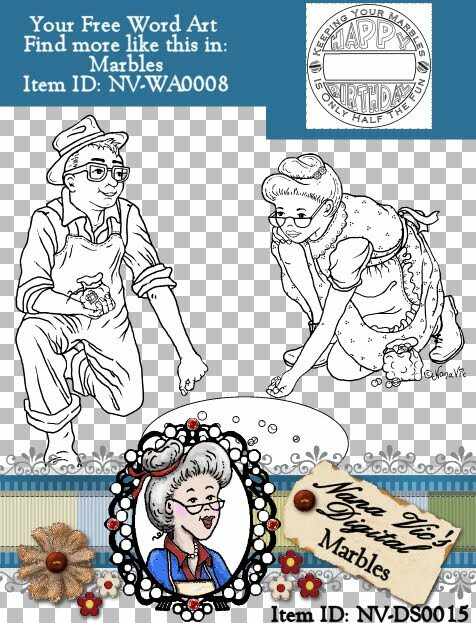 Who else would have thought to draw an image with an older couple playing marbles. Very cute!!! 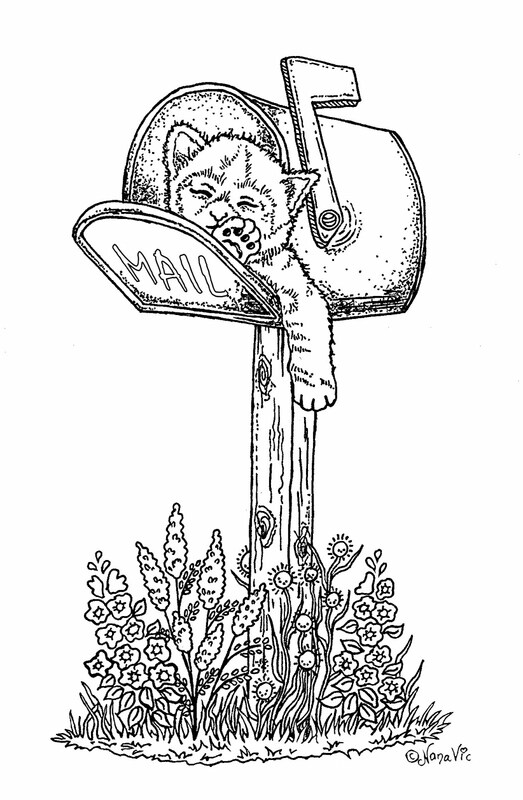 Sorry, forgot to thank you for the cute kitty in the mailbox digi. Love it! How fun is this Nana Vic Marbles?!? Wow, they look to be having a fabulous time! great images and thanks for the freebie! 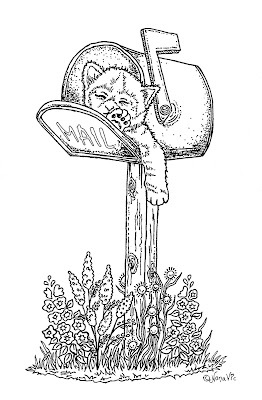 Love the Kitty Mailbox digi!! I see him on a purrdy card!!! thanks for being in the blog hop enjoyed ur blog very much! I am already a FAN - so what more can I say? Cute images and a SALE? I'll be back!! So glad I am a member of your group, love your people, adorable as heck. Great images! I love the kitty in the mailbox. Too cute! I'm already a big fan of your images, totally love them! The cat in the mailbox is super cute! Great digi's! I'd love to win your prize! Oh, I LOVE your images! They have wonderful charm and warmth. Thank you for sharing your talents! I look forward to seeing more of your work! The hop seemed like the perfect time to visit. I never have the opportunity to stop by the blogs of fellow designers at CDAC and I am having such fun! Love your images...I just love older people!!! Thanks so much for sharing!! I love Nana Vic and glad to meet her. I love how each image tells its own story. Your images are just adorable! Thanks for the kitten. Super sweet. Wonderful digi's. Love the site! Love the images. The Spoiled Kitty is too cute. TFS. Great images! I am happy I hopped by! Thank you for the sweet kitty! Great images! Love the kitty one! Love your images, Thanks for the freebies. What great digis! Thanks for sharing! Nana Vic not sure what to say your one of my favorite artist and I love all your images, Think I talk often enough on cdac. Glad you joined the blog hop. Such cute images. I'll be back. Thanks for the opportunity to win. I just can't get over how much you've grown in such a short period of time. I'm so excited to get some images from you! I joine dover on CDAC, I didn't see anywhere on your blog I could join. What lovely images, thanks for sharing! What darling digis. Keep them coming. Thanks for your part in the blog hop. You do beautiful work. I love your digi stamps. Just found you for the first time...I love your adorable images. I will be back after the hop!! TY so much for the gorgeous freebie! Your work is stunning! I just joined your group on CDAC recently and look forward to getting to know you and your work. TY so much for sharing your wonderful talent with us and for participating in the hop! It has been a fun little journey through the blogs! Cute images! I love the kitty in the mailbox - it took me a minute to realize you were offering it as a freebie. Thank you so much! I love your digitals - thanks for the opportunity to win!! Love your detailed digis. They are truly fantastic. Nana Vic is way cute! Your images are adorable. Thank you for the kitten. I look forward to stopping back by and looking at more of what you have. Really amazing images. you are very talented! I should have found your blog sooner. I am a Nana to my grandaughter. I love being a Nana and I love your Nana stamps. Thanks for the mail box/kitty freebie. It is very cute. Thanks again. Love your images. Great work in only 4 months. Will be checking out your complete works. Thank you for this so cute kitty image! I so enjoy your images. Yay Vickie! I made it here, didn't think I was going to find the time, but I did! You know I love your images! Great digital images! Nice to see your store! Happy World Card Making Day! I love your digis! They are just so cute. I am so glad I found your blog. Thanks for being part of the hop. It is so nice to see what my fellow artists' digis!! Love the cat in the mailbox! So cute!! I absolutely adore your digital images! They are so warm and have that appeal for all occasions! I love that Priscilla organized this hop so that we get a chance to see what our fellow artists create - yours is just incredibly adorable! Love your images. They are just so fabulous. Love th ekitten in the mail box! But all you digis are grand. What great exposure....my first time here and I think your digis are wonderfully warm and inviting!! I really enjoyed this blog, especially the word art. Gonna have to make a few purchases. How fun! Thanks for being a part of it. I love your images. I am trying to work on the "Spoilt Kitten" now but I keep coming back to the blog hop. Thank you for the kittie freebie! Your images are awesome... and you've only been doing this 4 months!!??!! WOW!! I'm off to the next stop on the hop! Great digis, and the kitten is adorable! I have six or so of your images already! "Spoilt Kitten" is the cutest! Great images and your word art! Thanks for sharing. Fun images and fun hop! Love the kitten in the mail box!!! Your images are beautiful. Love them. You have some really wonderful images!! LOVE your images! I'll be back to check out your sale this weekend. Thanks for the spoiled kitten, he's cute. Awesome images. Thank you for the freebie! wonderful images and I love the word art. Love your site. Cute digi stamps. Thanks for the blog hop. Love the kitten digi! I grabbed it up! I'm always on the lookout for cat and dog images! Thanks for hopping! :) And for the freebie! Love1 Love the word art! Your images are so lovely - I adore the "keeping your Marbles" one and the kitty sleeping in the mailbox is too precious. Hi There Nana Vic! I’m Nina from Paper Cupcakes and just wanted to leave a note to my fellows designers. It certainly is fun to get to know/meet some of our fellow artist and DT’s over at CDAC. Your images are super cute and some of them just bring a smile right to my face! Funny that you have 5 beautiful children, I have four ranging from 6 to 19, geeze, not sure where I find the time to even draw, I think it is how I keep my sanity about myself! :O) hope to see you around CDAC. Wonderful images! Thank you for being part of the blog hop! I am getting to know designers, and adding you to my fav list!